I love looking out the window today!!! The tempiture is 17 and the wind chile is -3 right now. Oh it is cold. There is ice/snow on the ground it is drifted up in piles. Yeah for no school for most. 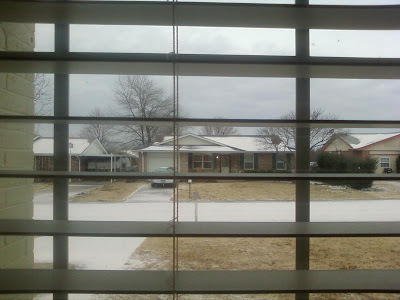 I know it is kinda sad that us Oklahoma people cancel everything with just this much ice/snow. But we have to take what we can get right. Zoey told me today that "Buster" scares her in her room. Who is "Buster" you might ask? Well Jon and I asked Zoey. She took Jon's had and ran to her room. They looked under the bed and she said there he is. She said that he scares her sometimes but she closes her eyes and he cant get her. He apparently has arms and legs and a body like hers. Poor Zoey has a "Monster" under her bed already. The question is What is my favorite thing to cook for my family? Well my families favorite meal is Spaghetti. I make my own sauce it is super easy. simmer on low till noodles are done. This time of the year I have cooked a turkey and we have been eating it over about a week. My favorite thing to make is turkey noodle vegetable soup. yum sound so good I might make that for dinner tonight.